Your support is helping us save lives. 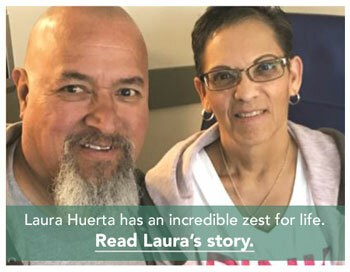 At the age of 38, Laura Huerta, an El Paso resident, was diagnosed with breast cancer. 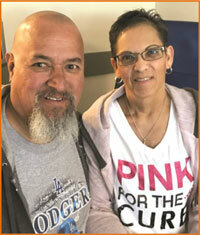 In the last 20 years, she has successfully battled the disease because of new drugs available during two reoccurrences. Laura is grateful to the cancer patients who first participated in clinical trials years ago. In October, Laura’s doctor in El Paso told her the cancer had metastasized to her lungs and bones, and he had no more treatment options. She should either participate in a clinical trial, if he could find one for her, or he would refer her to hospice. Laura, who is enjoying her first grandchild, has an incredible zest for life. For her, hospice was not an option. Her doctor found a Phase 1 clinical trial at the UT Health Cancer Center and fully endorsed her participation. The 550 miles or 71⁄2 hours between El Paso and San Antonio did not deter Laura or her husband Rey. Since January, Rey has driven her to the Alamo City each week for treatment. The couple is overwhelmed by the kindness and generosity of the doctors, nurses, staff and volunteers at the Cancer Center. “Angels. Every person here is an angel,” they observed. Laura believes she has come full circle. She is thankful her participation in a clinical trial may one day help another young woman — perhaps one in El Paso. She is keenly aware many do not have the ability or resources to spend three days of every week seeking treatment out of town, so she hopes the drugs that are giving her more time with her 1-year-old grandson will one day be standard care available everywhere. Please consider joining the Cabinet today. Your gift makes a difference in supporting research that makes lives better...like Laura’s!